Day 1 — 24 hours since these guys woke up. I fed them again at 8am, and now at 8pm, one of them is clearly doing much better than the other. It’s twice the size, and is bubbling like crazy. 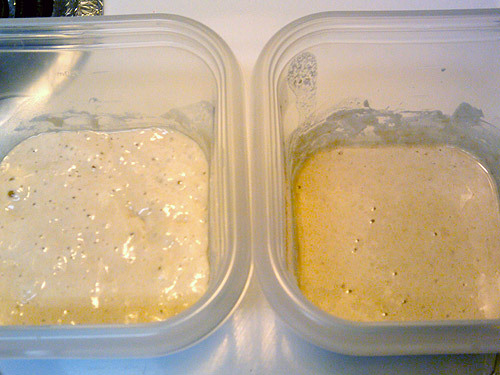 The other one is just kind of hanging out, bubbling a little but not too much, and hasn’t risen much at all. But I still have hope that it’ll get its act in gear. It’s interesting to note that the one doing much better is the 03/08 batch that was in the freezer. The 06/08 batch from the pantry is the sad one. I wonder if freezing kept the bacteria fresher somehow. My understanding is that low temperatures just slow the yeast/bacteria in starter down, but once the temperature approaches 100, they start to die off. Any chance the temperature in the house has been near triple digits in the last couple of years? I don’t think so — we haven’t had any problems with the air conditioning, so I doubt it’s been over 80 at all. I guess it’s possible that this batch didn’t dry as well somehow; to make a true fair comparison, I should have used samples from freezer/pantry that were dried on the same date.